iMindMap Home & Student versie 11. Voor meer dan 25 gebruikers: neem contact met ons op voor de precieze prijzen. Uitgebreide mogelijkheden om meerdere fraaie presentaties te maken en te bekijken. Exporteren als Pack & Go om alle bijbehorende bestanden mee te exporteren. Make great looking Mind Maps with our image library, our clever Sketch Tool and a range of styles to maximise your Mind Maps. Create jaw-dropping Mind Maps with Branch Art designs, including arrows, lightning bolts, roads and more to visually represent your ideas. Export your Mind Maps as images, PDFs or share via social media – perfect if you want teachers, classmates or colleagues to see your work. 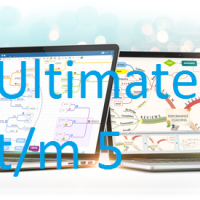 iMindMap also integrates with popular tools such as Google Drive, Evernote and Dropbox. Draw upon resources from an array of channels by adding text notes, web links and files. Add videos, spreadsheets and more to ensure that your every source of inspiration is covered. Outline Panel works in sync with Mind Map View. Use the Search Filter to locate and organise ideas within the canvas quickly. Your thoughts appear in a list, allowing you to view them with ease.